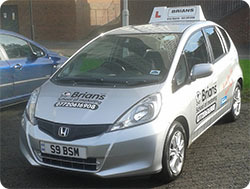 I am a Fully Qualified DSA Approved, Grade A Driving Instructor with over 30 years experience. All tuition is delivered in a patient, friendly and professional manner. I achieve a high first-time pass rate. For your convenience I provide tuition during the day, evenings and over the weekend. All levels and abilities are taught. Nervous and mature pupils are always welcome. I provide theory test training. My prices are highly competitive and I offer discounts for block bookings. For qualified drivers looking to advance their driving skills, or who simply need a confidence boost, I offer Pass Plus, Motorway and Refresher Courses. All lessons are on a strict one to one basis. A free door to door service is provided. The training car I use is a Honda Jazz.